It seems as if some white college students still haven't learned that blackface isn't OK. 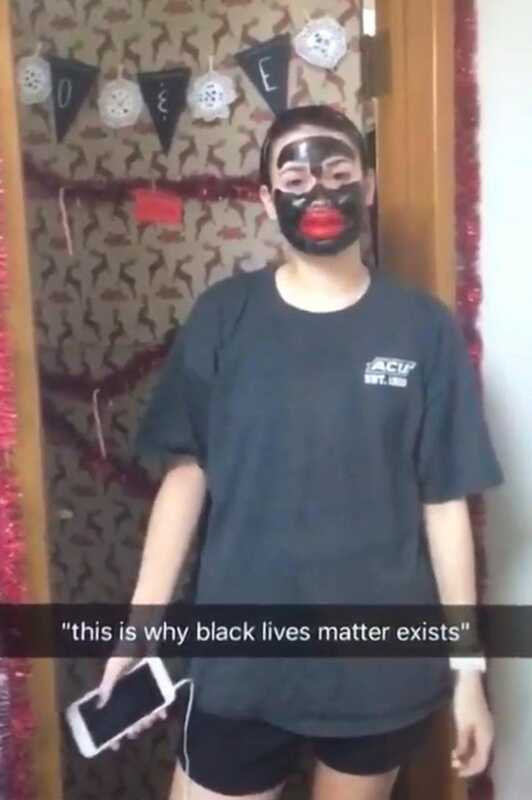 This time around, a video of an unidentified female student from Abilene Christian University in Texas wearing full blackface was posted to Snapchat, according to the New York Daily News. All of the students involved were summoned to university President Phil Schubert’s office after he was notified about the video Monday afternoon. A meeting was held that included Schubert, the university's anti-harassment coordinator and the dean of students. "They are no longer students at ACU," said Schubert in a statement. "I cannot emphasize strongly enough that this kind of hurtful behavior has no place on our campus or on behalf of ACU." According to the Daily News, in the video, the unidentified student said, "I'm a strong black woman," before putting on a pair of oversized lips. Several people can be heard laughing in the background. The caption on the video read, "[T]his is why black lives matter exists." It's unclear how many students were expelled over the video. "I really can't believe someone did this … at our 'Christian university," a fellow student tweeted. "Who would have thought." Schubert said that the video is an inaccurate representation of the school.